As we move through 2019, rate parity issues remain as big a deal as ever for hoteliers the world over. Disparity is the difference between quoted prices on hotels’ own websites and those shown by online travel agents (OTAs) and other third-party channels. Numerous polls and our own data indicate that it’s a headache for the vast majority of revenue and distribution managers. We continue to raise awareness of the subject through our regular reports for the US and Europe, a webinar, our eBook and in the first two instalments of this three-part series, in which we ask what hoteliers need to know about rate parity and offer three steps to navigating the challenge. But how did we reach this point and what shape does the distribution landscape now take? In the last part of this series, we tap into graphical elements of the eBook to explore the past 20 years and where we’ve ended up. Though far from exhaustive, this timeline highlights some of the key events, product launches, acquisitions and technical developments that have impacted on hotel parity since 1996. For additional context, entries in orange - in the main timeline and the mini timeline on the right-hand side that runs in parallel - relate to OTAs that feature in our first parity report. As more and more OTAs spring up, their USPs and business models become more and more diverse, as do their partnerships they rely on and corporate groups to which they belong. 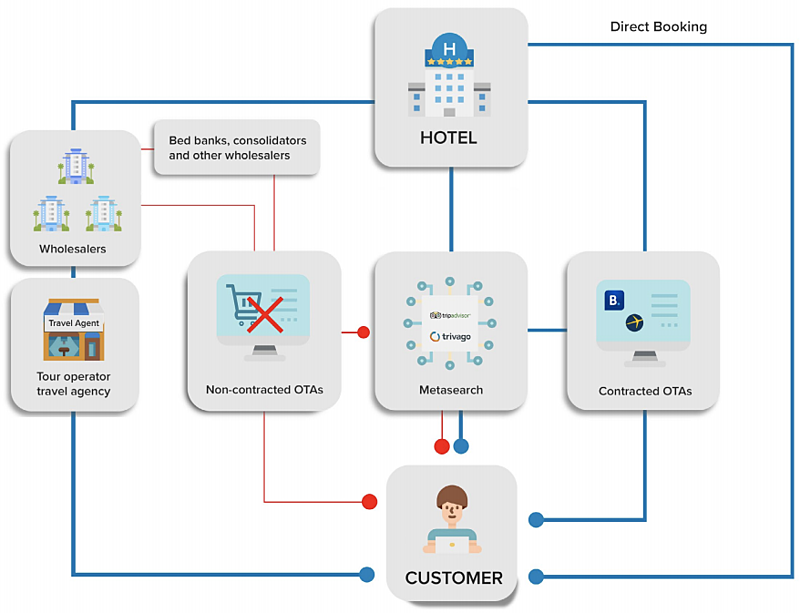 The parity landscape has evolved into a complex web of relationships between the main players: hotels; wholesalers; OTAs contracted with hotels; non-contracted OTAs; and metasearch engines. These factors are traded off against each other depending on supply and demand, and hoteliers’ risk appetite, strategy and targets. It all relates to how revenue and distribution managers work together to achieve a good distribution mix. Wholesalers typically agree a discounted rate with the hotel based on their demand or historical performance at that property. They should sell these rooms as packages, either direct to tour operators or through OTAs. The agreement is undermined if “de-packaged” and sold below parity, and in most cases constitutes a breach of contract. Metasearch engines aggregate searchable information from hotels and OTAs, providing users with a springboard to their sites, where transactions are completed. They don’t directly contribute to disparity but go a long way in highlighting disparate rates to users - and this is part of their appeal to users. Many factors govern their content, with pay-per-click (PPC) playing a small part. OTAs sell rooms through contracts with hotels, so B2B2C or wholesalers (directly or via other consolidators buying from wholesalers), so B2B2B2C. Typically they work with the merchant model, with a discount off BAR and connections to central reservation systems (CRSs) or channel managers. With contracted OTAs, disparity can arise for a number of reasons, including: “stale” cached data fed into external systems; tax miscalculations or technical inconsistencies; or from property-level hoteliers offering OTAs rates lower than Brand.com. When OTAs buy from wholesalers (or other OTAs), pricing is at their sole discretion, meaning disparity can creep in. The more links there are in the chain, the more opportunities there are for intermediaries to reduce some of their margin for an easy sale but still each retain some profit. This shows up as disparity if the end-user price is below the Brand.com price. 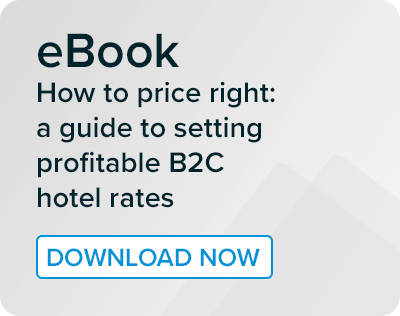 For a wider discussion of the issue or parity, download our eBook, Hotel rate parity: understanding and meeting challenges.